The Acting Chairman of the Economic and Financial Crimes Commission, EFCC, Ibrahim Magu on Monday said public funds stolen by 32 entities (human and corporate) between 2011 and 2015 was well over N1.3 trillion. 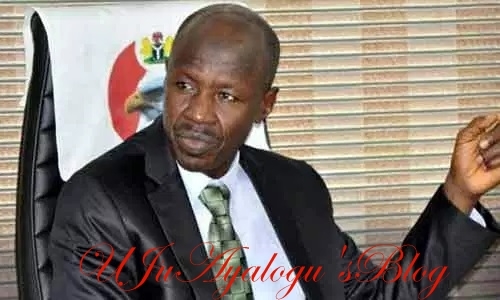 Magu disclosed this in his keynote address at the opening ceremony of the 2019 First Batch Conversion Training Programme to Procurement Cadre for Federal Parastatal and Agencies, organised by the Bureau of Public Procurement (BPP) in Lagos on Monday, March 25, 2019. In the paper delivered on his behalf by the Commission’s Secretary, Ola Olukoyede, Magu decried this huge financial loss on the country. He said the poor state of procurement process in Nigeria was one of the major reasons why corruption has continued to thrive in government agencies and parastatal. He identified some of the fraudulent practices in procurement process in Nigeria to include: kickbacks, conflict of interests, fraud in the bidding process, bid suppression, collusive bidding, bid rotation and market division.